The city of Catherby is famous for the wide variety of fish that can be caught from the fishing spots near the shore. And of course, there are lots of other things to do here, from Farming to Quests, along with a few different shops. There are quite a few other things around this city to see, from quests to farming patches and more. In this dungeon, you can find several Dwarves and a bar. There are some level 20 attackable dwarves along with NPC dwarves. Khorvak, the Dwarven Engineer is part of the Between a Rock...Quest. Holoy is the owner of the crossbow shop. Rohak is part of the Recipe for Disaster quest. You can also find some Dwarven Stouts on the tables, which will raise your Mining and Smithing levels by 1 for a short time. Not only are there dwarves, but there is also a gnome. Captain Nino is a gnome who is part of the Gnome Cuisine Activity. The Farming patch is located at the northern part of the town. There are 2 Allotment patches for vegetables, 1 Herb Patch, and 1 Flower Patch. There's another Farming Patch to the east of the town, for growing Fruit Trees like Apples. In the house to the west of the town is a bottle of Insect Repellant, rumored to kill Swarms. It's also used in the Merlin's Crystal Quest. On the top floor is a Jug of Wine. The house east of there is Caleb's house, which contains a Range for cooking and a Sink. There's a Pie Dish, Burnt Fish, Jug of Water, Knife and Bucket of Water respawn in here too. Caleb is one of the brothers from the Family Crest Quest. In the house to the east is are 3 treasure chests locked up in a cage. In the house south of Caleb's house is another Range for cooking. The Candle Shop in Catherby sells regular Candles for 3gp each. Behind the Candle Shop is a crate used in the Merlin's Crystal Quest. 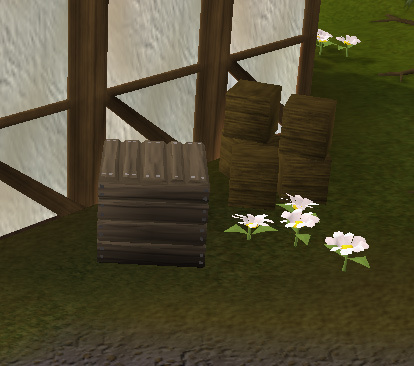 This bank is commonly known for storing your freshly caught or cooked Fish. 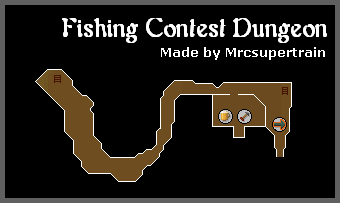 You can usually buy or sell fishing supplies from other players here. Harry's Fishing Shop sells different types of Fishing equipment, including Members' items. To the southeast are quite a few Fishing Spots, where you can catch all sorts of fish, from Shrimp to Sharks. 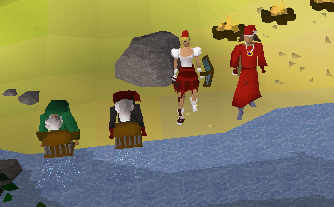 It's by far the best place to go fishing if you're level 68 Fishing or lower, as there is a cooking range and bank nearby for easy access. East of the fishing spots is an agility shortcut. 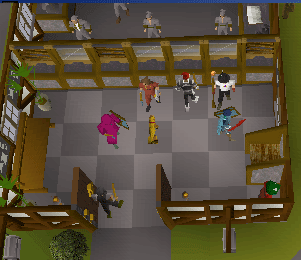 To use this shortcut, you need 35 Ranging, 32 Agility, 35 Strength, Fishing Contest completed, and a Mithril grapple hook. This shortcut is one way from Catherby and takes you over White Wolf Mountain. 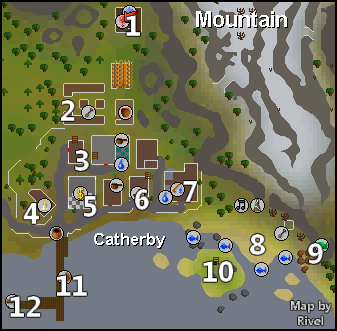 North of the fishing spots is another agility shortcut. 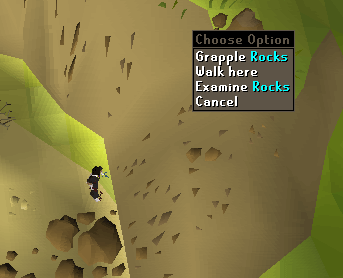 To use this shortcut, you need 29 Ranging, 36 Agility, 22 Strength, and a Mithril grapple hook. 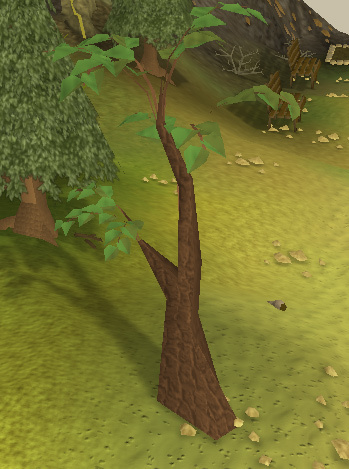 This shortcut is one way from the island, meaning you cannot use this shortcut from Catherby. The island used in this shortcut contains the Water Obelisk. This General Store is just like most of the others, it sells all of the basic items that an adventurer like yourself might need. The General Store is run by Arhein, who is found on the docks. The nearby ship is also part of the Merlin's Crystal Quest, and it will bring you to Keep La Feye if you hide in the boxes behind the Candle Shop during the quest. South of the General Store is a dock for Charter Ships. 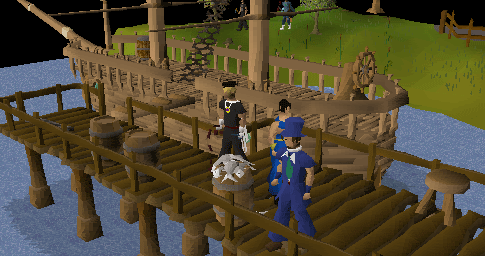 Here you can charter the Crewmembers and travel to different ports around RuneScape, for a fee.